Muddy Loafers: CAROLINE LUCRETIA HERSCHEL – SURVEYOUR OF THE STARS. CAROLINE LUCRETIA HERSCHEL – SURVEYOUR OF THE STARS. The fascinating life of Caroline Herschel proves beyond doubt that ingenuity, inquisitiveness and a keen sense of observation can override any physical disability or handicap. She was born in Hanover Germany, on March 6th 1750, to Isaac Herschel a musician in the Hanover Military Band and Anna Ilse Mortisen a housewife. Small pox disfigured her face at the age of three, leaving her with a drooping left eyelid. At the age of ten, an attack of Typhus dwarfed her stature, leaving her with a permanent height of 4’3”. While her father saw to it that she had an elementary education, her mother was convinced that she was fit only to be a scullery maid. Caroline’s brother Frederick William Herschel who was twelve years her senior, rescued her from such a plight and took her away to England to keep house for him. He was a musician who had settled in Bath. He taught Caroline music and helped develop her voice. She became a well known soprano and even began to sing professionally. But her brother had a passion for Astronomy since childhood. Though he was an outstanding instrumentalist, he gave it all up to pursue his passion. He trained his sister to be his assistant. She gradually began to share his interest in astronomy and worked closely with him. However, the telescopes they could afford were small and the images projected were often blurred. So the two worked together to build their own telescope, until they were satisfied with the clarity of the images it projected. William impressed on his sister that important discoveries could be made only through systematically observing the heavenly bodies, their interesting features and their relative positions in space. 1st, 1786, she discovered her first comet and was the first woman astronomer to do so. It was called ‘first lady comet.’ Between 1786 and 1787, Caroline discovered eight comets and several nebulae. William began to develop many more powerful telescopes. Caroline assisted him by grinding and polishing the lenses. In 1787, King George III officially employed her as William’s assistant. It brought in a modest salary of 50 pounds per annum. She became the first woman to be paid for scientific services. Caroline also helped her brother to develop a modern mathematical approach to astronomy. Between them, they discovered 2500 nebulae and compiled their findings in a new General Catalogue. When William died in 1822, Caroline returned to Hanover, but continued her work in fields of astronomy and math and also in cataloguing nebulae. An asteroid was given her second name Lucretia and a lunar crater was named after her. In 1828 at the age of 75, she received a gold medal from the Royal Astronomic Society. She became the first woman to receive honorary membership of Britain’s Royal Society. On her 96th birthday, the King of Prussia presented her with the Gold Medal of Science. 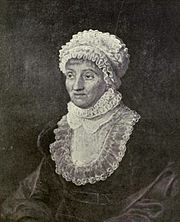 Though Caroline Herschel was a dwarf in stature, God gave her the enviable gift of surveying the heavens and reading the poetry of the stars.